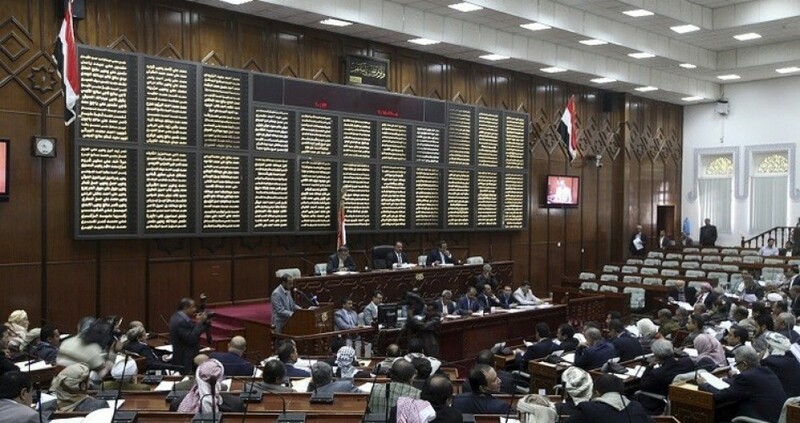 Despite the opposition of the Yemeni`s internationally recognized government, participated the President and members of the House of Representatives in Sanaa, under the Houthis group "Ansarullah" in a session of dialogue for a European parliamentary conference held on Thursday evening in the French House of Representatives under the title "Yemenis forgotten in the war," via a video. The Sanaa-based Yemeni" Saba" news agency reported that the Speaker of Parliament Yahya Al-Rai`e said in a speech during the meeting as saying: "Peace is an end we seek and extend our hands through you and through all peace lovers of the free world, in every occasion and effectiveness and we will continue to extend our hands to peace. " He called on all parliaments of the world to put pressure on their governments to ban the sale of weapons to the countries participating in the Saudi -led coalition in Yemen, and stop all military actions on Yemeni territory and the opening of sea, air and land ports. The Yemeni Minister for Parliament and Shura Council informed the French charge d'affaires that Hadi government and parliament members and presidency are worried about "promotion for coup and instigation against legitimate government and parliament", said Aden-based Saba News Agency loyal to legitimate government. " The French diplomat stated that his government supports Yemeni legitimate President Hadi, according to Saba. The French Parliament, he added, makes their decisions separately away from government, but he would convey the message and notification to authorities concerne, according Aden-based Yemeni "Saba" news agency. At the session, which included parliamentarians, a number of non-governmental organizations and diplomats, stressed the Deputy Speaker of the Yemeni Parliament, Abdulsalam Zabia, that "legitimacy is represented in the members of the House of Representatives present at home and they are represening Yemen in all its political spectrums." "We in Yemeni parliament as representative of the constitutional legitimacy and the republican for the Yemeni people, we reject on behalf of all citizens of the Republic of Yemen any foreign presence on Yemeni territory in any case under any name." He added that "It has become clear to all the ambitions of the countries of aggression, especially Saudi Arabia and the UAE in its occupation of the oil and coastal provinces," adding that the biggest evidence is what is happening now in the province of Hodeidah west of the country of killing and destruction. Member of the Yemeni Houthi –controlled-Parliament, Ahmed Shaye presented paper on "Arms sales to the countries of aggression on Yemen" and the member Abdel Bari Dogheish presented paper on the "humanitarian situation in Yemen". The member Bassam Al-Shater presented paper on "Opportunities for peace in Yemen"
The parliamentary papers called on the participants in the conference to put pressure on their governments to end the war and blockade, address the humanitarian situation in Yemen, stop arms sales to the countries participating in the Saudi- led coalition and contribute to the peace process. It also called on the parliaments of the world to put pressure on their governments, especially the permanent members of the UN Security Council to issue a resolution to remove Yemen under Chapter VII and the abolition of Security Council resolutions (2216, 2140) and lift sanctions on Yemeni citizens. At the end of the conference, 50 parliamentarians from European countries demanded an immediate cease-fire in the country and the return parties of the conflict to the negotiating table. They also called for the suspension of arms exports to the Yemen conflict parties, and in advance the Saudi-UAE coalition, as called for by international human rights organizations. The organizers of the conference stressed that their call to stop the war is of great importance for the first European parliamentary front to collectively call on European governments to stop the war in Yemen. The conference reviewed the humanitarian situation, stressing that the suffering of civilians in Yemen is no longer intolerable, and that the war launched by the Saudi-UAE coalition is "unjust and absurd".